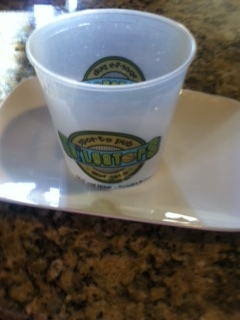 Thank you Pastures and Plates for a great idea for snowy weekend cooking! A unique twist on tacos…..
1/2 cup cheddar cheese in circles on parchment paper. Bake at 425 for 5-7 minutes. Let cool slightly, then hang them over a spatula or utensil handle to form as shells. Her filling was super easy as well – cooked chicken in the crockpot with Rotel tomatoes & green chiles, and threw in some taco seasoning. Shredded and offered lettuce, avocado, salsa and more cheese. She also made a lime sour cream (YUM) which was just sour cream, fresh lime juice, lime zest, salt and garlic powder. Heather has two daughters who keep her super busy on competitive sports teams, so an easy crockpot meal is just the ticket. Thanks for sharing my good friend, and thank you to all of my followers for stopping by! Perfect snack — lunch or dinner…. As I watch it raining ice/snowing outside, it makes me sad to think of all the children who anticipated hunting for Easter eggs today, and all the people who devote so much time and effort to organize those events. We are trying something on the smoker today — smoking a chuck roast that will turn into burnt ends. I found on the WWW that it has several names, one being Poor Mans Burnt Ends. However, there is nothing cheap about buying beef chuck roast. Anyway, we’ll see how this turns out, and will let you know (and share the recipe, if it works out). However, in the meantime, I wanted to try something that I thought my roommate would like for lunch. Here in the midwest, we love everything with gravy, and one delish meat item that goes with gravy is chicken fried steak. I made steak strips or fingers using beef cube steak, and whipped up some quick homemade gravy to dunk them in. Well, it was a hit, and I’ll be doing this again. Note that the flour is really seasoned which is key, and I actually cut the steak into strips before it was completely thawed which made it a little easier. Hope you have a wonderful Easter, and thanks for spending some of your Sunday with me! Slice steak into thin long strips about 1/3 – 1/2” thick. Set up a dredging station: In a bowl, combine flour, garlic powder, onion powder, paprika and cayenne, and season with salt and pepper. In a shallow bowl, whisk together milk and eggs. Season steak strips with salt and pepper. Dredge the steak strips in the flour mixture then add them to the egg mixture and turn the pieces to coat. Return steak to the flour and dredge once more. In a deep skillet or dutch oven, add about 1” of vegetable oil and heat over medium heat. When the oil is shimmering and about 350°, place the steak strips, one by one, into the oil . (Do in batches) Cook until golden all over, about 2 minutes per side. Place them on a plate lined with paper towels to drain off any excess grease. Make gravy: In a small skillet over medium heat, melt butter. When the butter is foamy, whisk in flour and cook mixture until the flour is golden, about 1 minute. Gradually whisk in milk and bring mixture to a boil. Reduce heat to gently simmer the gravy until thickened. Season with salt and pepper to taste. A twist on good ‘ol grilled ham & cheese! We used to be big fans of a show called Down Home with the Neeleys. They did some unique tricks, all good, and all with a BBQ flair. I’ve made several things that they aired on TV, and one yummy one that I’ve never shared is a Memphis Monte Cristo. You can view it on their site, but I’m sharing it below for your convenience. It’s your typical Monte Cristo, but BBQ’d up a little. And, not only is it GOOD, it’s very economical, and it’s quick! The final product, ready to be attacked! Five minutes, and ring that dinner bell! Hope you enjoy as my family has, and thank you Lord for the rain!!! Preheat oven to 350 degrees. Heat a large skillet or griddle pan with vegetable oil. In a medium bowl, whisk the eggs, cream, sugar, salt and cayenne until blended. Spread some BBQ sauce on each slice of bread. On 4 slices of bread, add 1 slice each of the cheese and meats, then repeat layers. Top with the other piece of bread and press the sandwiches together with your hands. Dip into wet batter and turn to coat. I love quiche and gruyere is one my favorite cheeses, although pretty darn pricey, but I thought I’d take a shot at this recipe, adapted from Food Network Magazine. I took it to work and it was a hit, so thought I might share here. Super easy, and you don’t have to sell the farm to buy the gruyere…I just bought a small container of it shredded which wasn’t too bad. Preheat oven to 425 degrees and place a baking sheet on the middle oven rack. Scatter the ham and cheese in the bottom of the pie crust, and onion if you are including it. In a large bowl, whisk the eggs, half and half, chives and season well with salt and a few grinds of pepper; pour into the crust. Transfer to hot baking sheet and bake until the eggs are set and the top is lightly browned, about 30 minutes. Place on rack to cool a little; can be served immediately or refrigerated. I had this appetizer as my meal a year or so ago at the Saltgrass Steak House while on a work trip in Westminster, Colorado. No words to describe how great it was. Not sure why I got inspired this weekend to try it, but so glad I did. I wanted to post with the holidays approaching, as it’s kind of “fancy” but super easy!!! Hopefully you will enjoy as much as we did….it’s super rich, and also, you can use imitation crabmeat. I didn’t but it’s probably just as good (and cheaper)!!! Chop crab and season with salt, pepper and lemon juice. Chop avocados and season with salt and lemon juice to prevent browning. I do all of it ahead of time and when ready to serve, put together. Spray inside of object that you’re going to use to construct this beast with cooking spray, then place on plate, and layer away. 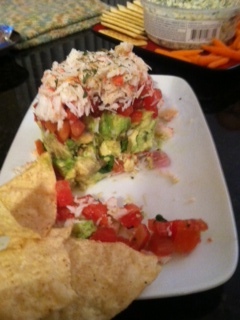 You can do it in any order, but I recommend avocados, pico and finish with crab. Finish with chopped parsley and serve with tortilla chips.